Today I'm participating in Jessica Stanford's Magical Product Swap! This week I have been trying to squeeze in some time to prep for my classroom. While looking around online I found the coolest math posters on Teachers Pay Teachers. They are created by Katie Lyon from the Art of Possibility for Teachers. You can find here Teacher Pay Teacher store here. Do you have students who struggle with knowing which operation to use when solving word problems? I love these posters because they are bright and colorful. 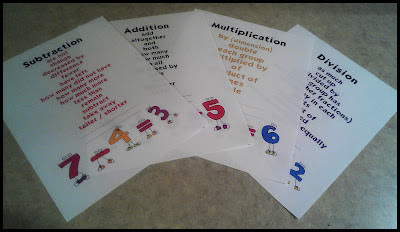 Her first poster shows all the math keywords for each operation, addition, subtraction, division, and multiplication. I'm going to print four of these on each page, laminate them, and then tape them to students desks for the to reference throughout the year. Also included, are four posters that focus on the keywords for each operation individually. I printed these, laminated them, and plan on displaying them on my classroom wall! Included in her packet is also a math worksheet for students to practice solving math word problems while using these posters as a great reference. I can't wait to try this out with my kiddos in September. Looking for more great back to school ideas? Pop on over to Katie's blog. Then take a look at some other cool products at Jessica's product swap! Those posters do look really nice. I went to a math workshop last year that was probably the single best math training Ive ever had. It was by Chris Cain. He's big in NC for math and was a huge part of our shift to CC. One of the big topics he focused on was problem solving. He talked about a shift from identifying keywords to solve because they can be confusing and have multiple meanings. Instead he encouraged us to focus on the structures of word problems and to help the student recognize what is happening. I did that last year, and they got pretty good at it! This year I want to start with expressions so they can write expressions to represent the problem. I think bloggers are missing the point of the first posting here. You should not be using key words to teach mathematics. These words are good for a year or two and then in third grade when the words are used in different ways, the students are left with no resources and score poorly on state assessments. Mary ran two times around the track on Monday and three times on Tuesday. How many times did Mary run around the track? Students will multiply these two numbers using the word "times" as a key word. Do NOT do this. An awesome piece of information for kids. I would like to get some funny math sums for my education CD. Kindly help! How would you suggest teaching how to solve word problems to students if using key words is ineffective?